Kinder Morgan has been granted an injunction against protesters who have been blocking crews from doing work in the Burnaby Mountain Conservation Area. The company said the protesters have been interfering with survey and drilling work it needs to complete for its submission to the National Energy Board on the proposed Trans Mountain pipeline expansion. On Friday, just before 10:30 a.m. PT, a BC Supreme Court judge's ruling was released, giving protesters until 4 p.m. on Monday, Nov. 17, to clear out. The company has also filed a multi-million dollar civil suit against some of the protesters, seeking damages from lost revenue due to the delays. Stephen Collis, one of three Simon Fraser University professors named in the civil suit, calls it a bullying tactic. "It's really aSLAPP suit—a suit that's not a serious suit at all, but it's intended to shut up activists and stop them from participating in the process by gumming them up in courts and making them accrue excessive court costs and lawyer fees." The $5.4-billion Trans Mountain pipeline expansion project would almost triple the current petroleum product throughput capacity between the Edmonton area and B.C. 's South Coast, from 300,000 barrels a day to almost 900,000. Kinder Morgan has said it would prefer to bore its new pipeline through Burnaby Mountain rather than follow the existing pipeline route through residential and business areas. The City of Burnaby has said it opposes the expansion. Surveyors, right, working on behalf of Kinder Morgan in preparation for the Trans Mountain Pipeline expansion project are forced to leave the site by protesters on Burnaby Mountain in Burnaby, B.C., on Wednesday October 29, 2014. The proposed $5-billion expansion would nearly triple the capacity of the pipeline that carries crude oil from near Edmonton to the Vancouver area to be loaded on tankers. Trans Mountain is seeking an immediate court order to stop citizens from impeding survey work for a new pipeline route through a conservation area on Burnaby Mountain. It asked for a court hearing for 2 p.m. Friday to hear its request for an interim injunction. It is also seeking a permanent injunction and damages after a group of protesters blocked the company’s work crews Wednesday. Simon Fraser University professor Lynne Quarmby told the Sun she was in her office around 5 p.m. when someone delivered her secretary a “big weighty mass of paper” without saying a word. As Quarmby read through the document — about three inches thick, she reckoned — she realized the document was a lawsuit and she was listed as a defendant. In the application, the company is asking the court to “restrain the defendants’ trespass upon Burnaby Lands, and their wrongful obstruction, impeding, interfering with and prevention of” its field work on the mountain. Quarmby said she rejected the company’s claim that she was trespassing. Project lead Carey Johannesson claimed in an affidavit that accompanied the court documents that company workers set up signs around them that read “NO ENTRY” then got to work. He claimed protesters soon arrived, then “verbally attacked” and stood in the way of the crew. Johannesson said the conduct of the protesters was intimidating and he was concerned for his physical safety. Quarmby said she was in the park at the time, but on a teleconference call, and did not see any of the activity Johannesson claimed occurred. “While I was just standing in a park ... I also don’t necessarily believe the accusations in this document. I honestly don’t think that’s even true,” she said. It is seeking damages, interest and costs. Johannesson’s affidavit sets out some of the harm the company is claiming to suffer at the hands of the defendants. They include $5.5 million in direct costs and $88 million in lost revenue for Trans Mountain for each month of delay for the project. Quarmby said she plans to appear in court Friday to ask for more time to read the papers and prepare a defence. “I’m not going to sit by and let this happen,” she said. Kinder Morgan has an order from the National Energy Board that prevents the City of Burnaby from stopping the company’s work crews, even though the land is a city-owned conservation area, and the City of Burnaby is dead set against the pipeline expansion. Burnaby plans to appeal the NEB order at the Federal Court of Appeal level. Kinder Morgan sought the NEB order after city staff ticketed the company’s work crews for cutting down trees in a public park. 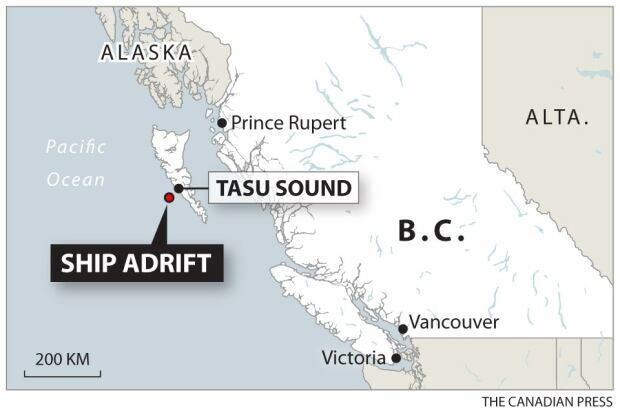 An incapacitated Russian cargo ship is now in port in Prince Rupert on British Columbia's north coast, ending fears that the vessel, which lost power Thursday night, would drift ashore, hit rocks and spill hundreds of tonnes of fuel. The Simushir was towed to port by a U.S.-based ocean-going tug, the Barbara Foss. Engine repairs on the Simushir are expected to be completed within two days. The Simushir lost power due to a mechanical failure late Thursday off Haida Gwaii, also known as the Queen Charlotte Islands, as it made its way from Everett in Washington state to Russia. The Canadian Coast Guard ship Gordon Reid arrived on scene Friday night and started towing the disabled ship away from shore, but three attempts to keep a towline attached failed and the ship was adrift again for six hours Saturday daytime. The Simushir, which is about 135 metres long, was carrying a range of hydrocarbons, mining materials and other related chemicals. That included 400 tons of bunker oil and 50 tons of diesel. 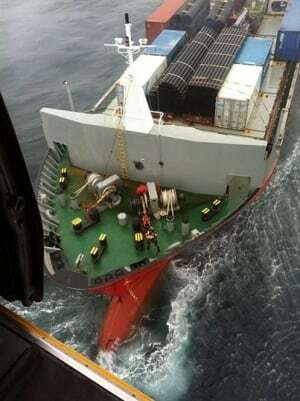 The vessel is not a tanker but rather a cargo ship. In comparison, the tanker Exxon Valdez, spilled 35,000 metric tons of oil. A spokesman for Russian shipping firm SASCO, the owners of the vessel, said it is carrying 298 containers of mining equipment in addition to heavy bunker fuel as well as diesel oil for the voyage. 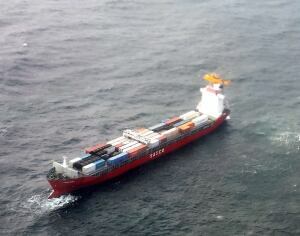 Officials said the captain of the Simushir was reported injured and was evacuated by helicopter Friday afternoon to Sandspit on Haida Gwaii, but they were given no further medical details. The Simushir is registered in Kholmsk, Russia, and owned by SASCO, also known as Sakhalin Shipping Company, according to the company's website. The SASCO website says the ship was built in the Netherlands in 1998. A large oceangoing tugboat has arrived to help a Russian cargo ship carrying hundreds of tons of fuel that is once again adrift off the west coast of Haida Gwaii. A Canadian Coast Guard vessel began towing the incapacitated ship Friday evening, but lost the first two tow lines and then finally its third tow line late Saturday morning. A spokesman with the Canadian Forces' Joint Rescue Co-ordination Centre in Victoria told CBC News at 11:30 a.m. PT that the Canadian Coast Guard vessel Gordon Reid had tried three times to attach lines to the Simushir, but that all three lines had snapped. Navy Lt. Cmdr. Desmond James said it wasn't wholly unexpected that the lines to the Simushir, to use nautical terminology, parted. "What's good is that she's very far off the coast. We've put some really good distance there," he told CBC News Saturday morning. The coast guard is also dealing with waves as high as four metres. The Simushir, which was 14.5 kilometres offshore when the Gordon Reid secured the first tow line at 6:30 p.m. Friday night, was reported to be 46 kilometres from land as of 9:30 a.m. Saturday. Two other vessels, the Canadian Coast Guard vessel Sir Wilfrid Laurier and U.S. Coast Guard cutter Spar, are standing by to provide assistance, but aren't properly equipped to secure and tow a large ship, James said. The hope is that the oceangoing tug Barbara Foss, which arrived at the scene at 5:30 p.m. Saturday, will be able to secure and direct the cargo ship. "That really puts us in a good position to kind of made some decisions on the way ahead," James said. An RCAF Cormorant helicopter, RCAF Buffalo aircraft and U.S. Coast Guard Jayhawk helicopter remain on standby and have been pre-positioned in Sandspit, should any of the remaining 10 crew members on the ship need rescuing, he said. The Russian carrier Simushir lost power off Haida Gwaii, also known as the Queen Charlotte Islands, on Friday as it made its way from Everett, Wash., to Russia. Earlier Saturday, James said the operation was "very dynamic," but had been going well. He said the question of where to take the ship would soon have to be answered. "The decisions now, or what they're looking at, is at what point do we want to start making this tow from a westerly direction to a northerly direction, and start to get back toward a plan or an idea that will allow us to plan to bring this vessel toward the shore," he said. "We don't have a location or any of that — I know people are asking — but really, we want to start making this vessel start making headway northward." Canadian Prime Minister Stephen Harper also tweeted his thanks Saturday morning for the "great work" the Gordon Reid ship was doing off the coast. The ship was drifting northwest in stormy seas Friday, away from shore, after losing power late Thursday, officials said. The fear of oil spills is especially acute in British Columbia, where residents remember Alaska's 1989 Exxon Valdez disaster. Such worries have fed fierce opposition — particularly from environmentalists and First Nations communities — to a current proposal to build a pipeline that would carry oil from the Alberta oilsands to a terminal in Kitimat for shipment to Asia. Opponents say the proposed pipeline would bring about 220 large oil tankers a year to the province's coast. The president of the Council of the Haida Nation had warned Friday that a storm coming into the area was expected to push the ship onto the rocky shore of Moresby Island, but later council president Pete Lantin said their worst fears have subsided. "If the weather picks up it could compromise that, but as of right now there is a little sense of relief that we might have averted catastrophe here," Latin said. About 5,000 people live on the island and fish for food nearby, Lantin said. The Haida Nation said it had set up an emergency command centre in Old Massett, located on the northern tip of Haida Gwaii, in case the vessel runs aground. Roger Girouard, an assistant commissioner with the Canadian Coast Guard, said their top concern was the fuel and diesel oil on board and the risk that the ship could hit the rocks and break apart. He earlier said if the ship did come apart the rough seas would break up the oil "so we would have an ally there. It's cold weather so we don't have a lot of migratory species right at the moment." He said they have been already moving assets to the region to respond should the break apart and spill. Acting Sub.-Lt. Ron MacDougall said the Simushir, which is about 135 metres long, was carrying "a range of hydrocarbons, mining materials and other related chemicals." That included 400 tons of bunker oil and 50 tons of diesel. The vessel is not a tanker but rather a cargo ship. In comparison, the tanker Exxon Valdez spilled out 35,000 metric tons of oil. A spokesman for Russian shipping firm SASCO, the owners of the vessel, said it is carrying 298 containers of mining equipment in addition to heavy bunker fuel as well as diesel oil. The U.S. Coast Guard had a helicopter on standby in the event that 10 crew members need to be pulled off the ship. Officials said the injured captain was taken from the ship by helicopter, but they were given no further medical details.